I cannot believe what I just saw from our beloved Ducks! They beat Arizona by eight (83-75) in Tucson in front of 14,000 screaming Wildcat fans, when the last 49 teams coming to McKale Center could not! I’m shaking my head and mumbling gibberish and would have yelled and exulted at the incredible victory — were I not so stunned. This is not a game recap, analysis or even a heavy-duty editorial; this is my own commentary on something rare and amazing in Oregon sports history, and I welcome your reactions and thoughts as well. 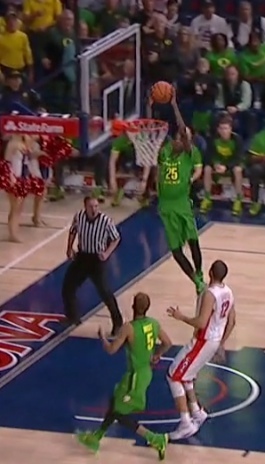 Chris Boucher caught a perfect pass on the break. I knew the odds were highly against the Ducks when their average loss to the Wildcats was 27 points last year, and they were invincible on their home court. The beginning of the game confirmed my fears, as Arizona played tough defense and did some superb passing to set up great shots for the Wildcats. They hit shot-after-shot, and I was wondering if they were ever going to miss! The first shot that didn’t connect came on their 9th … after eight in a row? Their crowd was awesome and just going nuts. My thoughts went back to the Ernie Kent days when Lute Olsen purposely brought the starters back into the game at the end in order to win … by fifty. 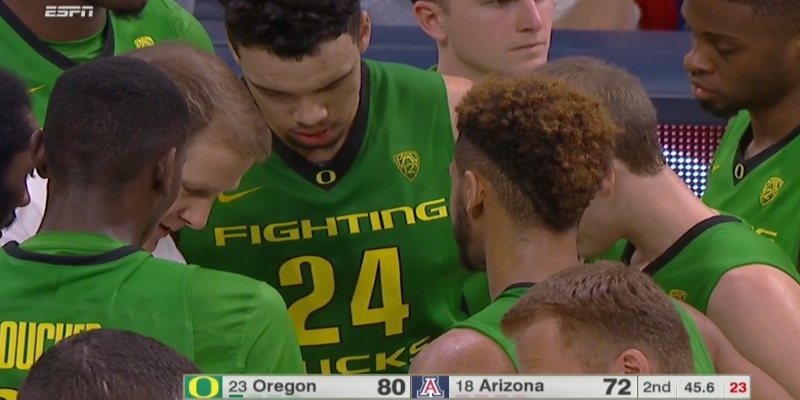 This was better talent on the Oregon bench, and they were tougher than prior teams, yet Arizona looked like the elite program that they are. I’m shocked and staggered … that Oregon has been able to come back and win this game. Our Ducks did, and it .. was .. so .. gradual, and they did it the right way – running their motion offense to get open shots and hitting them. They played great defense and forced an extraordinary number (19) of Wildcat turnovers; they blocked shots and ran the floor with few errors of their own. Dillon Brooks drives through talented defenses like no player I can recall, and for him to do it a couple of times per game is not unusual. It seemed in this game he was extra-wired to get past his defender and get up the shot high off the glass. One of the ways that Dillon Brooks succeeds against the bigger-quicker guys? He’s a Ping-Pong player. The Men of Oregon ran the distance in the game as most starters put in a high number of minutes, and the three-point shooting of Dwayne Benjamin coming in off the bench helped keep the Ducks inching back. Roman Sorkin also came in for 10 minutes and gave the Ducks some good blocking out on the boards of Arizona’s two big guys. It was great to see him get confidence in such a big game! This game has been about Oregon’s toughness. 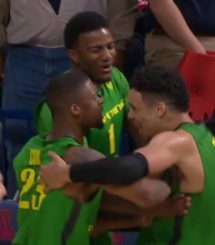 Jordan Bell, Elgin Cook, and Dillon Brooks celebrate. They were rising to the occasion, overcoming the incredible challenges that this little tiny, skinny, scrawny Oregon Duck team is. They come in and play against the big bruisers and have beaten them soundly in their building. That is why we watch the rest of the season, and this team is so entertaining to view. One of the great victories in Oregon basketball history.